GenR: First would you like to introduce yourselves, your roles in the MOOC, tell us about the MOOC team, and where your based? Sabine Barthold: Franziska Günther and I are researchers at the TU Dresden Media Center. We are part of the EU-Horizon 2020 research project MOVING with nine partners in six European countries. In the MOVING project we are developing a platform that provides a combined space for collaboration, research and training. The goal of MOVING is to provide a digital space in which people can improve their data and information literacy — particularly with regard to data mining and social web skills/attitudes — while they are working with the platform features (i.e., database search, visualization, online collaboration tools & communities). What we at the Media Center contribute to the project is the didactics and the learning content. The MOOC “Science 2.0 and open research methods” is part of this concept and is aimed at a particular group of users — namely young scholars. GenR: How did the ‘MOVING MOOC’ and the specific MOOC course ‘Science 2.0 and open research methods’ come about. What are the motivations behind the MOOC? SB: When we started the project there were a number of new developments in the digitization of science and scholarship — a new scientific culture of sharing and openness was emerging that took advantage of new networked technologies, social media and other digital platforms. Terms like “open access”, “science 2.0”, “open research”, “citizen science” and so on were floating around that indicated that there was a major shift underway in science communication and collaboration. That was also the time that the Leibniz Research Alliance Science 2.0 was founded of which the Media Center is part of. Today all these movements meet under the label of Open Science — but we stuck with the title “Science 2.0 and open research methods” that we proposed early on in the project. The motivation for the MOOC was that we perceived a discrepancy between these new movements that signaled a major change in the way that research was done and lack of awareness, necessary skills and attitudes in students and (young) researchers for these shifting practices. A major part of the problem was that open science methods were not part of their education and training as researchers. They were not encouraged to acquire these new methods by their advisors. To the contrary — we often saw senior scientists who opposed these new technologies and the open access movement explicitly advising younger colleagues and students against open science. So we wanted to provide a training offer for young scholars that would fill this knowledge gap and clear up existing prejudices and misconceptions regarding open science. That is why we made the MOOC. There are several advantages in conveying these skills and competences in a MOOC: You can reach large numbers of learners at once, and with minimal effort compared to the traditional forms of scientific methods training. Also, an online course is a safe space to ask difficult questions, address insecurities and question long-held beliefs about doing research — open discussions that you normally wouldn’t have in an advisor-student relationship. And as an asynchronous learning format, learners are flexible and can decide themselves when and where they want to learn. GenR: What is your approach to the course topic “Science 2.0 and open research methods” and who is the course for? SB: Like I said above, because it is a fairly new movement open science and science 2.0 means different things to many people. In the MOOC we try to make people aware of these differences, but focus on aspects that most of the open research advocates can agree on — like the need for open access publishing, new forms of scholarly communication, digital means of collaboration, and how young scholars can benefit from all these new developments. After all, open research makes a lot of everyday academic work easier and better and helps young scholars in building a reputation and advance their careers. If science is open, everyone benefits: individual researchers, students, universities — think of all the financial resources that are freed up through open access! And society at large that often doesn’t get access to the results of publicly funded research. The only group that is losing is obviously the major scientific publishers with their ridiculous profits. Their power is the result of monopolizing a key position in the system of scholarly communication — namely providing access to the results of scientific research. And that is about to change. There is a slogan in the open science community that gained prominence recently: “Open Science — just science done right”. This is really the message that we want to get across in the MOOC. GenR: What is covered in the four week MOOC course? SB: The MOOC is designed as a four week crash course. We wanted to give learners a broad overview of open collaborative science — like a roadmap that helps them to oversee the many opportunities of open science and then go and focus on specific topics and aspects that are most useful to them own their own. Each week is covering one of four main topics: (1) What is open science, what are the main aspects and why should I care; (2) how have digital tools and platforms changed the information landscape and the way we do research; (3) how has open science changed scholarly communication and collaboration; and (4) how can I make my own research more open? GenR: What is it that you see as being beneficial things that participants will take away with them, as researchers, from the course? SB: For us, getting involved in open science was like an epiphany. Not only makes open science many aspects of research and scholarship easier or more productive. It helps you build professional networks and ultimately advance your career as a scientist. Being an open researcher is very empowering especially for young scholars, who are the ones that shape the future of academia. We hope that we can spark this spirit in the MOOC participants and inspire them to become better scientists. GenR: Is the course intended as a primer, so that participants can understand the field, or as a standalone unit that can be made use of with no further directed follow up? SB: It is a crash course intended to provide a general understanding of the field for students and scholars that are completely new to the topic. There are other, more comprehensive, training offers in open science — like the Open Science MOOC — and more focused, discipline-specific programs in open research out there. We want to provide a low-threshold introduction to open science newcomers on which they can then build on. GenR: Is the course a one off or is it part of a package of courses or connected packages or offerings, like literature, other types of courses, etc.? Will the course be repeated? We have planned two identical rounds of the MOOC. The first round was in November 2018 and the next starts now on January 21st. After the live run the MOOC will be modified a bit and can then continuously be used as a self-study course for young researchers on the MOVING platform. The overall feedback from the participants was very positive and we were surprised how many people were interested in the topic open science and what we’re doing with the MOOC. We don’t have a concrete plan yet, but we have some ideas how we can build on the MOOC and provide more diverse and specific open science training and advocacy in the future. We will see what happens as the need for training of this kind is obviously there. GenR: It would be interesting to hear more about the wider MOVING programme, as there appear to be interests to support ‘search’ use and ‘social media’ use with the MOVING software and/or platform? SB: MOVING is a work and training platform. We have a search engine that allows users to query at once research literature databases, (we use the ZBW database for economics literature, the GESIS database for social sciences literature, and CORE for open access literature), websites and social media (Twitter), OER databases (Videolectures.net) and then explore the search results with elaborate data visualization tools. Besides finding research literature, you can also search specifically for funding opportunities and learning material (OER) with the search engine. With MOVING communities you can collaborate with others on the platform on any topic you like. You can have an open community that is free to the public like a forum, or a semi-public or private community from smaller research groups that want to organize team collaboration. You can also use it for training and education, in individual learning groups you can use communities to create your own online course or learning community. That is pretty unique. GenR: Some questions for you both as open researchers (and can I get a reply from each of you individually). GenR: What are your top three favourite tools or platforms? And what open tool is missing (sorry only one)? SB: There are so many useful tools and platforms out there, it is hard to pick just three. But if I have to, here’s five instead: I really love Zotero for literature management and collaboration. I use Kopernio and Unpaywall for open access literature search. And I think Zenodo and Figshare are probably the most important platforms for sharing research with the world. What I miss is an adequate replacement for commercial academic network sites like ResearchGate and Academia. There is ScienceOpen and I really like what they are doing. But it would be great to have an open non-commercial platform that integrates all the useful tools and features that you need as a researcher in one system that you can use to share research and data, network with others, collaborate in projects and so on. It could also be a decentralized system with many small (university) platforms that are connected and communicate with each other. There are some promising new developments like ORCID, OSF, or Altmetrics that help integrate existing platforms. But right now I see no user-friendly alternative to the commercial platforms like ResearchGate. Franziska Günther: I recently discovered the Altmetric Bookmarklet, which you install in your browser. Through clicking on it you get the Altmetrics for the article you’re looking at in the browser tab. I also really like the idea of Hypothes.is, to annotate the whole web and discuss with the whole web. I often use the “Open Science Training Handbook” because it offers a very good compilation of training possibilities and best practices in the field. I can only support Sabine’s demand. And it needs a decentralized and non-commercial network for science communication. Can we all move from Twitter to e.g., Mastodon? GenR: And last, do you have one personal favourite thing going on in ‘science 2.0/open science/open scholarship’ at the moment? For example, I think open models for ‘energy’ for its innovation in tackling green issues is really exciting, opENmod https://wiki.openmod-initiative.org — even though it’s a pole apart from my own work in open publishing systems. SB: I am so focused on the meta-level of science and the changes in academic culture and politics right now, that I can’t name a single actual open science research project from the top of my head. I think in general there are so many research topics are highly relevant for society and important for the lives of so many people (climate change, medicine, energy etc.). It is a shame if they are hidden behind paywalls or kept from the public through a system that rewards petty and competitive attitudes in researchers. I am thrilled to see that this system is now changing at such a fast pace. And I’d like to be (a small) part of that change. Franziska Günther: I am totally excited about the combination of open science, citizen science, and gamification. The project “FoldIT-Puzzles for Science” is a good example: Players unfold proteins by puzzling and thereby supporting research. By the way, much better than a computer can at the moment! The course starts 21 January 2019! You can enrol here if you want to participate. Each week a new session will be activated. After this you can use the study material in a self-guided way. Special: Live webinar on 24 January 2019 – 2:00 pm (CET) on Adobe Connect in which we want to discuss challenges and chances for open science with each other. We will have a special guest, open science expert Bianca Kramer (101 Innovations in scholarly communication). Week 4 Make your research open! ‘William Gibson – Wikiquote’. Accessed 18 January 2019. https://en.wikiquote.org/wiki/William_Gibson. Barthold, Sabine, and Franziska Günther. ‘MOVING MOOC Science 2.0 and Open Research Methods’, 2018. https://moving.mz.tu-dresden.de/mooc. Kramer, Bianca, and Jeroen Bosman. ‘Innovations in Scholarly Communication | Changing Research Workflows’, 2016. https://101innovations.wordpress.com/. WLP. ‘The World Lecture Project’. (wlp)°, 2019. https://world-lecture-project.org/. Altmetrics. ‘Bookmarklet – Altmetric’, 2019. https://www.altmetric.com/products/free-tools/bookmarklet/. Bezjak, Sonja, et al., Open Science Training Handbook, 2018. https://open-science-training-handbook.gitbook.io/book/. openmod. 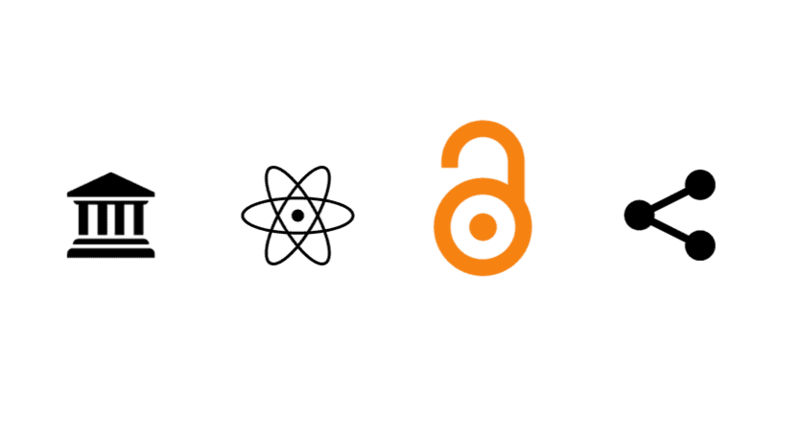 ‘Open Source and Open Data in Energy Modelling’, 2019. https://wiki.openmod-initiative.org/wiki/Main_Page. UW Center for Game Science. ‘Solve Puzzles for Science | Foldit’, 14:03:59 GMT. https://fold.it/portal/. MOVING MOOC aims to show young academics how to utilize the Web 2.0 technologies to search, access and use information, to organize knowledge, develop new ideas, build networks with other scholars, public institutions and society. Learners will understand the principles of open science and how they can contribute to a culture of openness in their everyday research life.